Soft and subtle and perfect for everyday use. 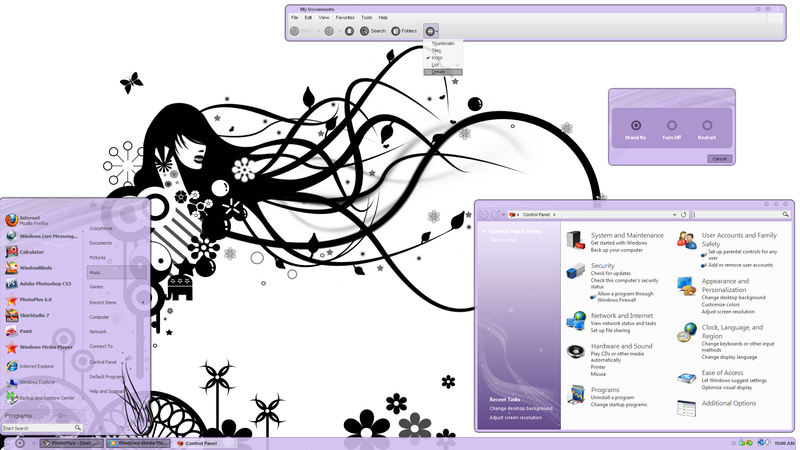 "3RD PLACE WINNER IN THE 3RD COMMUNITY CONTEST"
Now for XP, Vista and Windows 7. This skin has been fully revamped and updated, now every substyle is in correct and working order. Voidcore: I unpinned all but 2 items on the all progs.....and guess what? yep it cut And unfortunatley i really cant change the design any further to accomodate 2 items on the proggylist...it would mean a whole redisgn of it. So I do appologize and am sorry that this skin is unusable for you, ill make sure my next skin is useable for *ANY* number of items....... best of luck in the comp for you also. Now this is a skin. Most of the other skins (very very good) tend to look the same. PLEASE keep this up this site needs more skins like yours. "Very" Nice Skin, but it feels incomplete without the wallpaper. Where can I get it?